If you want a glimpse of how Louis XVI may have lived, it’s not necessary to trek all the way to Versailles, the massive royal palace on the outskirts of Paris, a trip to which will take up an entire day of your visit to the City of Light. Don’t get us wrong: Versailles is definitely a “bucket list” day trip for many. But if you’re hoping to save some time and yet also experience over-the-top opulence and more gold leaf than Donald Trump’s infamous golden bathroom, head to Paris’s Palais Garnier. 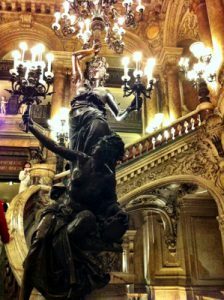 Typically called just the Opera Garnier, this gorgeous Beaux-Arts and Neo-Baroque palace was built on the border of the 2nd and 9th arrondissements in the late 19th century to host the renowned Paris Opera. 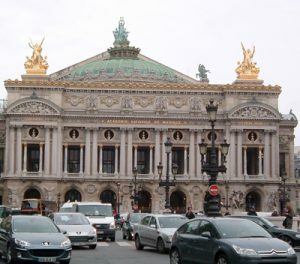 The facility today still is part-time home to the Paris Opera (the recently built Opera Bastille facility took over most of the opera performances) and is now also the home base for the Paris Opera Ballet. The facility also is home to the Bibliotheque-Musee de l’Opera de Paris, which is a part of the French national library. Most non-Parisians, however, probably are most familiar with the palace as the setting for the 1910 novel The Phantom of the Opera and the 1986 Andrew Lloyd Webber musical of the same name. But let’s circle back to its construction: You’ll notice the timeline of the building’s erection is in the late 19th century, 1861 to 1875, to be exact. And yes, Louis XVI was made a foot shorter on top in 1793, nearly 100 years earlier. So, you won’t actually be walking in Louis’s footsteps when you attend a performance or a daytime tour of the opera house (hence our use of the term “may have lived” above). 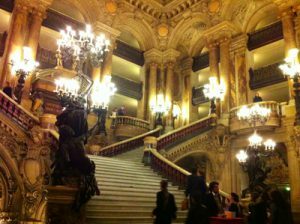 However, the level of opulence at Opera Garnier is so dizzying that many consider it to be even more lavish than Versailles. You’ll at least feel like 18th century royalty when you visit here. 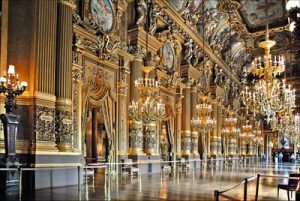 The opera house was to be called the Salle des Capucines due to it’s location just off the Boulevard des Capucines, but almost immediately Parisians dubbed the building the Palais Garnier after it’s architect, Charles Garnier. Garnier, born of humble origins in Paris in 1825, went on to become an apprentice of renowned French architect Louis-Hippolyte Lebas and a graduate of the Ecole Royale des Beaux-Arts de Paris. In 1860, Napoleon III announced a competition for the design of Paris’s new opera house, and Garnier was one of 170 entrants into the two-part selection process. Garnier won fifth place in the initial round of the competition, securing his spot among seven finalists. A more rigorous process for the second round of the competition involved revisions of the contestants’ original plans, and a jury, led by the director of the opera, Alphonse Royer, selected Garnier as the winner. Construction began one year later. 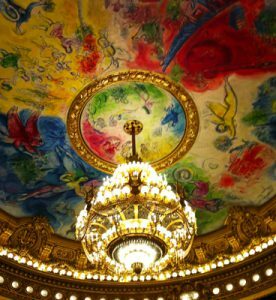 Inside the auditorium itself is a true gem: an incredible 2,600-square-foot ceiling fresco depicting classic operas painted by Marc Chagall. There also are ceiling frescos by Paul Baudry depicting the history of music; hallways with elaborately detailed mosaic ceilings, the first of their kind created outside of Italy; a seven-ton bronze and crystal chandelier hanging in the center of the auditorium; several uniquely designed rotundas, including the Salon du Soleil (Salon of the Sun), with mirrored walls and a golden dome adorned with a sunburst, and the Salon de la Lune (Salon of the Moon), a mirror of the sun-themed room, only decorated in silver and with a dome adorned with moon rays; numerous statues; and a seeming fortune in gold-leaf-covered décor. And it’s not just the interior that’s impressively ornate. The façade is an amalgamation of contributions from 14 painters, 73 sculptors and a number of mosaic artists, chief among them Charles Gumery, Francois Jouffroy, Jean-Baptiste Claude Eugene Guillaume, Jean-Baptiste Carpeaux, Jean-Joseph Perraud, Alexandre Falguiere, Aime Millet and Eugene-Louis Lequesne. But anyone passing by the Place de l’Opera can marvel at the gorgeous exterior of the building, and we’re focused on what’s inside. 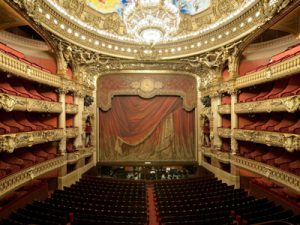 There are two ways to get a peek at the opulent interior of the Opera Garnier. The most obvious, of course, is to buy a ticket to one of the many performances at the palace. For example, upcoming performances include the ballet Oneguine by John Cranko, the Kaija Saariaho opera Only the Sound Remains and the ballet Orpheus and Eurydice. 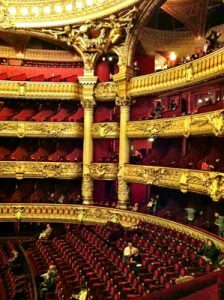 Tickets can be purchased online via the Paris Opera’s website at www.operadeparis.fr and typically run from a super-affordable €4 up to €180 euro. 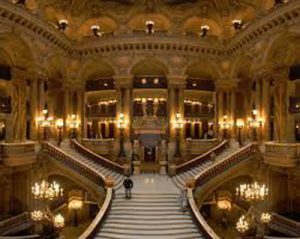 And the second way to visit the facility is to take a self-guided tour of the Opera Garnier’s public areas. For just €12 for adults, €8 for those ages 12-25 and free admission for children ages 11 and under, visitors can access the opera library-museum, the grand staircase, grand foyer, Salons de la Lune et du Soleil, a peek at the horseshoe-shaped auditorium, a special exhibition of opera and ballet costumes, and more. The tour is available daily from 10 a.m. to 5 p.m., with the last entrance at 4:30 p.m. Tickets can be bought online or on-site at a small ticket booth located on the western side of the facility near the intersection of Rue Auber and Rue Scribe. But if you are buying tickets in person, still be sure to check the opera’s website for a list of days when the tour is closing early or entirely to accommodate musical and dance performances. And be sure to bring your camera. You’ll be taking a lot of photos! 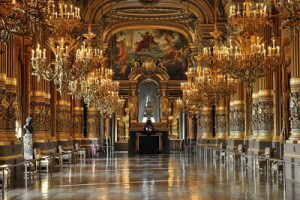 This entry was posted in Architecture, Beauty of Paris, Famous Paris destinations, French culture, French history, Right Bank, Sight-seeing and tagged Charles Garnier, Opera Garnier, opulence, Palais Garnier by Bob Adams. Bookmark the permalink.